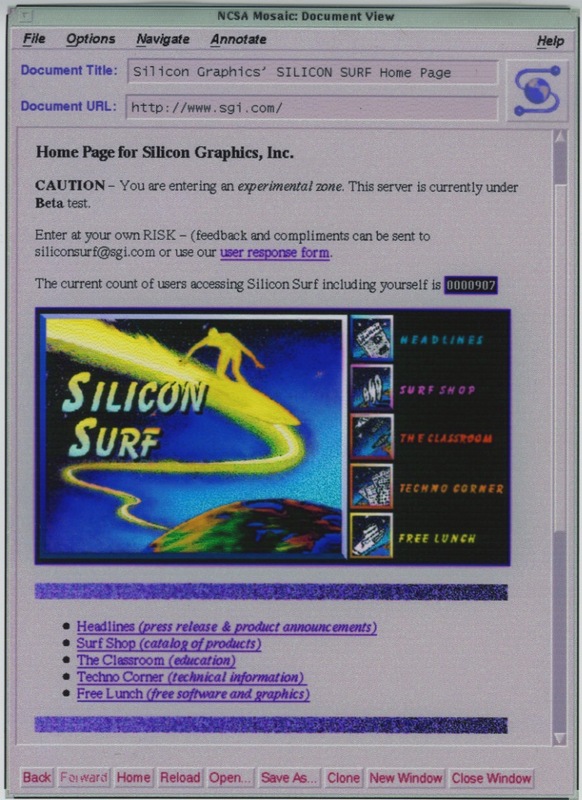 It was this webpage – SGI’s entry to the Web – which caused the Sun-internal Web-evangelists (including myself, to some extent) to go berserk and demand the creation of a Sun.COM website. I seem to remember Vasanthan being the eventual prime mover… ? You could click on DIFFERENT PARTS OF THE GRAPHIC and it would DO DIFFERENT THINGS! It was something called an IMAGEMAP! Highly innovative! Ha! It was also the reason my workplace (a part of Los Alamos Labs) dropped Sun and switched to SGI (to their later Security chagrin)… because the group leader went to look at what sites were “forward thinking” to the Internet. I also used “Silicon Surf” as one of the arguments as to why http://www.acorn.co.uk needed to happen :-). That imagemap blew me away, too.